For the occupied and oppressed Palestinians UN means Useless Nations. I must begin by making it clear that the UN of my headline is the Security Council not other component parts of the world body such as the United Nations Relief and Works Agency (UNWRA) which provides education, health care and social services for more than five million Palestinian refugees in the Gaza Strip prison camp, the occupied West Bank, Lebanon, Jordan and Syria. As a new year dawns I believe that those who are entertaining hope that the cause of justice for the Palestinians will be advanced by another Security Council resolution are guilty of wishful thinking. They may also be unaware of the history of Zionism’s success in corrupting and subverting the decision making process of the General Assembly as well as the Security Council. (This history, complete and unexpurgated, flows through the three volumes of my book Zionism: The Real Enemy of the Jews). The corruption and subversion started in the countdown to the vote on the General Assembly’s Partition Plan resolution of 29 November 1947. The vote was postponed twice because Zionism calculated that there was not a majority in favour of partition. Then, assisted by its assets in President Truman’s White House and 26 of its collaborators in the Senate, Zionism bullied and bribed a number of vulnerable nations to change their “No” votes to “Yes” or abstain. The result was a minimum necessary majority in favour of partition but… When President Truman refused to use force to impose it, the resolution was vitiated (became invalid); and the option Truman approved was sending the question of what to do about Palestine back to the General Assembly for another debate. It was while this debate was underway that Israel, in defiance of the will of the organized international community as it then was, unilaterally declared itself to be in existence. Many years later a long serving, very senior and universally respected UN official said the following to me in his office on the 38th (top) floor of the UN’s headquarters in New York. “Zionism has corrupted everything it touched, including this organization in its infancy.” I knew, really knew, that he was reflecting the deeply held but private view of all the top international civil servants who were responsible for trying to make the world body work in accordance with the ideals and principles enshrined in its Charter and international law. The Security Council’s complete surrender to Zionism happened during the protracted and at times angry behind-closed-doors discussions about the text of Resolution 242 – what it should and should not say. (The full story of this surrender is told in Goodbye To The Security Council’s Integrity, Chapter 3 of Volume Three of my book). The Johnson administration and all others responsible for drafting and then finalizing the resolution’s text were completely aware that the Six Days War of June 1967 was a war of Israeli aggression, not, as Zionism asserted at the time and still asserts today, a war of self-defence. That being so Resolution 242 of 22 November 1967 ought to have demanded an unconditional Israeli withdrawal and indicated that Israel would be isolated and sanctioned if it refused to comply. And for complete clarity of meaning a binding resolution ought to have stated that Israel should not seek to settle or colonise the newly occupied territories, and that if it did the Security Council would enforce international law and take whatever action was necessary to stop the illegal developments. But President Johnson refused to have Israel branded as the aggressor. (This was despite the fact that he was privately furious with the Israelis. He had given them the green light to attack only Egypt and their attack on Syria to take the Golan Heights for keeping provoked the Soviet Union to the brink of military confrontation with the U.S. Johnson was also fully aware that when Israeli Defence Minister Moshe Dayan gave the order for his forces to attack the U.S.S. Liberty his intention was to sink the American spy ship and send all on board to a watery grave. As it happened on 8 June the Israeli attack on the Liberty with bombs, napalm, torpedoes and machine gun fire killed 34 members of the vessel’s crew and wounded171, 75 of them seriously. The Liberty was attacked to prevent it sending an early warning to the Johnson administration that elements of the IDF’s ground forces in Sinai were being turned around to reinforce an attack on Jordan and Syria. The full story is told in The Liberty Affair – “Pure Murder” on a “Great Day”, Chapter 2 of Volume Three of my book. Who described the attack on the Liberty as “pure murder”? Israel’s chief of staff at the time, Yitzhak Rabin. The “great day” comment was made by Dayan in a note to Israeli Prime Minister Levi Eshkol.). (ii) Termination of all claims or states of belligerency and respect for and acknowledgement of the sovereignty, territorial integrity and political independence of every State in the area and their right to live in peace within secure and recognized boundaries free from threats or acts of force. So the question without an answer in the final text of 242 was – WHICH Israel were the Arab states required to recognise? An Israel withdrawn to its borders as they were on the eve of the 1967 war or a Greater Israel – an Israel in permanent occupation of at least some Arab territory grabbed in that war? But there was more to it than that. At the time the Security Council was agonising over the text of 242, the three major Western powers, the U.S., Britain and France, were united on one thing – the view that the Palestine file was not to be re-opened because, if it was, they might one day have to confront Zionism. Those responsible for framing Resolution 242 were very much aware that Israel’s hawks were going to proceed with their colonial venture come what may -in determined defiance of international law and no matter what the organised international community said or wanted. So some if not all of those responsible for framing 242 were resigned to the fact that, because of the history of the Jews (persecution on and off down the centuries) and Zionism’s use of the Nazi holocaust as a brainwashing tool, Israel was not and never could be a normal state. As a consequence, there was no point in the Security Council seeking to oblige it to behave like a normal state - i.e. in accordance with international law and its obligations as a member of the UN. Like it or not, and whatever it might mean for the fate of mankind, the world was going to have to live with the fact that there are two sets of rules for the behaviour of nations – one rule for Israel and one for all other nations. In that light Resolution 242 was confirmation that the Security Council had a double standard built into it, and because the political will to confront Zionism did not exist, there was nothing anybody could do to change that reality. What are the chances in the foreseeable future of a new Security Council resolution containing such a commitment? In my view there is not a snowball’s chance in hell. What President Truman feared could happen did happen. On dealing with the conflict in and over Palestine that became Israel the Security Council was put out of business by Zionism. The whole process was a disgrace from the start. The UN had a moral obligation to create the Palestinian state in 1948 and resettle the displaced. Instead it relied on the fraudulent population statistics of the Zionists to create this mess. History is repeating itself. Read the works of Josephus to see the fate of a people who allow fanatics and zealots to take control. Their mad rampages finally were crushed with overwhelming force--but not before hundreds of thousands had died. For instance, after Jewish zealots massacred 100,000 on Cyprus, Jews were forbidden to even gaze on the land because it was believed it caused them to go mad. That's what's happening in Occupied Palestine now. Madness. True, it is a Useless Nations so long as the US is still in a position to use its veto power. By the way, the grossly exaggerated significance of the missing definite article in the English version of resolution 242 is always overstated. So long as a piece of land is "occupied" [Note: with or without the use of the definite article], it still falls within the category of the illegality of acquisition of land through the use of force. Additionally, I am reliably informed that other versions of the same resolution in the official languages of the UN, has the definite article! Whenever a Situation that is Known to be Wrong and unworthy goes on long enough ...unabated and 'ignored' it becomes a circumstance that cannot be altered but by brute-force from the Masses. What is causing these Masses who should be able to define Right from Wrong to hang back..on the sidelines.. looking but not ever seeing ? Is it mind control.. ? Or is it as simple as power of suggestion ? Is it possible that when we Think we are Powerless, then we Are ? Where has our Backbone Gone ? Are the TOYS we are fed enough to keep us mindless ? If so, this 'bunch of hoodlums who have infiltrated our Countries`` guvmt... HAS to be Exposed and obliterated...Before There is no Will left anywhere in this country..to Fight For What is Right and Decent and Worthy of Salvaging. People ...Don`t you Realize you are Being 'Dumbed-down to the point of total inertia with your Electric toys, your senseless video games ( and otherwise ).. and that you have allowed yourselves to be bombarded with a sense of becoming a non-entity...just someone taking up space ? Shame on you ! Are you Just Like that poor Chicken in the barnyard That Believes it is Helpless and Unable to MOVE..Because It was Laid On its` side...and a line drawn in the 'sand' right under its` nose..and Told '' See ! You are Not able to move out of This ''circle' unless I Let you !! Now..What are you ? but mindless Followers and "Believers ?'' Who are being Drained...Robbed of Every ounce of strength and sense of Self.. By The ""So-called Leaders'' we are Allowing to Hem us in and Bring us down..Are we More akin to that poor dumbed down Fowl-bird than we want to admit ? Or, are we human beings who Know Better..but Is just Slow reacting against what we KNOW is Wrong..And will now get to Changing Directions that are more fitting to OUR Liking ..And To our sense of Self ? How are we going to Help These Oppressed Peoples, If we Don`t first of all, Wake up from our stupor AND begin helping ourselves >?? There is always a Beginning point...As well as An End point. Which Is more Plausible ? TO Do Nothing ..And Let ''The Drop Fall Where It may ?' How un-American Can THAT Be ?? The Answer lies within every one of us.. Wake UP before it is too late to ..Turn back the tide. Time Waits for no man. 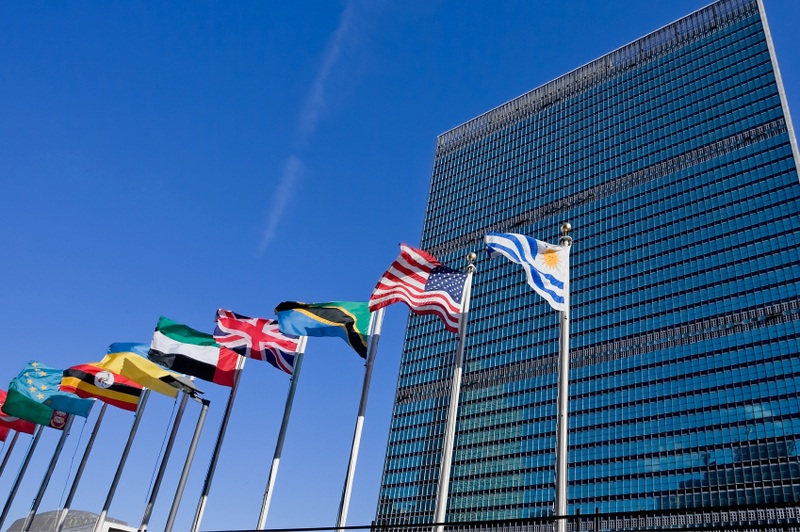 The United Nations Security Council was not established to resolve world conflicts through peaceful negotiations or international and moral laws ingrained in the charters of both League of Nations and the United Nations. The UNSC was created to keep the supremacy of the former five western colonial powers. Everyone who has studied how this world body gifted 56% of historical Palestine to European Zionist Jews to resolve Europe's 19-centuries-old "Jewish Problem", is not surprised by Jordan/PA fraud resolution. It's proposed by two US/Israeli agents - and the UNSC slapped nine million Palestinians by giving a green light to the Zionist regime to carry-on its 47-year occupation. I'm glad, Hamas and Islamic Jihad did not support the UNSC bid, as they know the only language the Zionist Jews understand is the way they established a state over Palestinian land. “To understand the dysfunctional US-Israel relationship which has been plagued with self-deception, betrayal and false intent from its inception. To begin with, one must understand that the state of Israel was in large part created by those who despised Jews,” Phelan said. Phelan, you got it exactly right... when you said ' the state of 'isitreal was in large part created by those who despised jews. IT was < Primarily done to Get the Jews Headed In That Direction..And OUT of Every country where they had lit ! It is a Shame that This was DONE...And even worse..That Nothing Good Will ever Come from this Gesture. Land WAs Taken from The Rightful Settlers ( Palestinians ) Of This Land given to these Wandering Nomads..the jews from all over..( whether Jews or NOT ! )....there has been nothing but trouble ever since. Give THEM a Foot, and they will Take The Whole Thing ! They Are Never satisfied . No Country Wanted them Alighting in Their Country...SO<<For Several years, Money was Being Collected And Funneled to these Users..For Support and TO give them more incentive to Stay there ! ! Who can we Blame for That ? Us Dumbees Who Took Someones```` word for This .. so they kept Right on Sending !! Look what WE All have on our Agendas NOW ! An Unwelcome HIt on our Hands that Never Lessens..But Grows.